Several black, shiny, magnetite crystals in a grey-green serpentinite vug. These crystals have the faces of the cube and octahedron with different proportions. 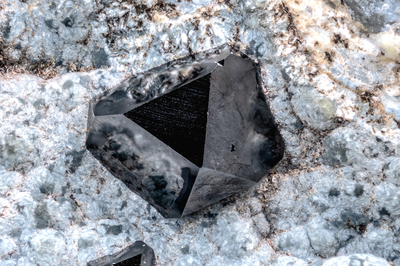 In this photo, a black crystal, shiny, so as to reflect on its faces part of the matrix. Clearly visible is the black face of the octahedron, while those of the cube are the ones developed at the sides of the triangle. Collection and photo of Gianfranco Ciccolini.